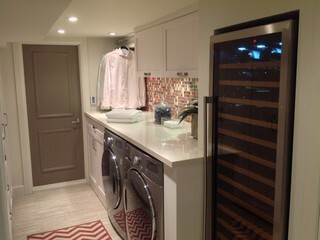 Wine Rack and Gift Wrapping in the Laundry Room? Many homeowners seem to be embracing dark, moody colors in their laundry spaces. The rich, slate-colored custom cabinets and 1-inch-square mosaic tiles seen above might give a clue as to why: They give this laundry room sophisticated appeal. Meanwhile, the double-stacked 27-inch-wide washer and dryer units could make any family envious. The open space and granite countertops make this space above easy to like. But the gift-wrapping peninsula turns it into it a room anyone can fall in love with. 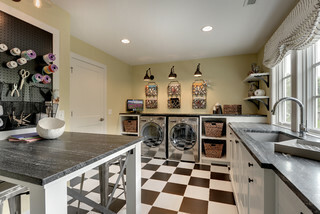 Please let us know what your thoughts are on these unique laundry room ideas!